Calling people into their destinies as sons and daughters of God! This morning I went to church. The service was great! The worship time was wonderful to be in God’s presence but unfortunately I didn’t understand much of the sermon. We also had American missionary guests at the church. After the service a couple of them prayed for people for healing. Then I introduced myself to the woman who came with them. I found out they do a lot of ministry work with the gypsy communities here in the Oradea area. It was very encouraging to talk to her and she also prayed for me too which also encouraged me too. After church I came home to have lunch before I went to Sabolciu. While I ate my lunch I listened to one of my home church’s sermons on the internet from Canada. The sermon I listened to was on the “Family Matters” series and the topic was about appreciation. It was a very good sermon and it was a good reminder to me to take time to appreciate people. There are two things we can appreciate people for which are: 1) to recognize them for who they are as a person are and 2) for something they have done. In the afternoon I went to the Sabolciu gypsy village with some of the staff and volunteers that I work with. It was so great to see the children and families today! We were there for around two hours (3:45 – 5:45pm). Tabita and I went to one of the homes to spend some time with one of the families and the other volunteers went to other homes (at the end of our time there they all joined us at the end). It was great to have some individual time with the children with the family we visited. We had a short discussion on being thankful. I shared the story from the Bible about when Jesus healed the ten men who had leprosy from Luke 17:11- 19. I find it interesting that Jesus healed ten people yet only one of them came back to thank Jesus. It is though a reminder to me and everyone of the importance to be more thankful. A group picture in the house we were in! something they are thankful for. Some of them had a bit of trouble to think of something to say right away so we helped them out with asking them if they are healthy or sick, if they have something to eat every day, if they have a house to live in. After we helped the children brainstorm a bit they were able to think of some things to be thankful for. Some of the kids said they are thankful for their family, sisters, brothers, parents, and their house, something to eat every day and for being healthy. I think this is a good topic to discuss with the children and families because even though they may live in a poor gypsy village there are still things they can be thankful for. We (the staff and I) help them a lot with getting medicine, food, clothes, etc but I hardly ever hear them say “thank-you” and instead most of the time I hear them complain about something they don’t like that I they have received. This really tears at my heart because I really believe having a right attitude of being thankful gives you a better perspective on life. Yes, I do realize that they probably were not taught this growing up so they don’t teach their children this but right now they can change that and start doing it. This is something that we could probably teach them to do and pray about and then hopefully over time they will learn to do this themselves. We also spent some time coloring with the children today too. 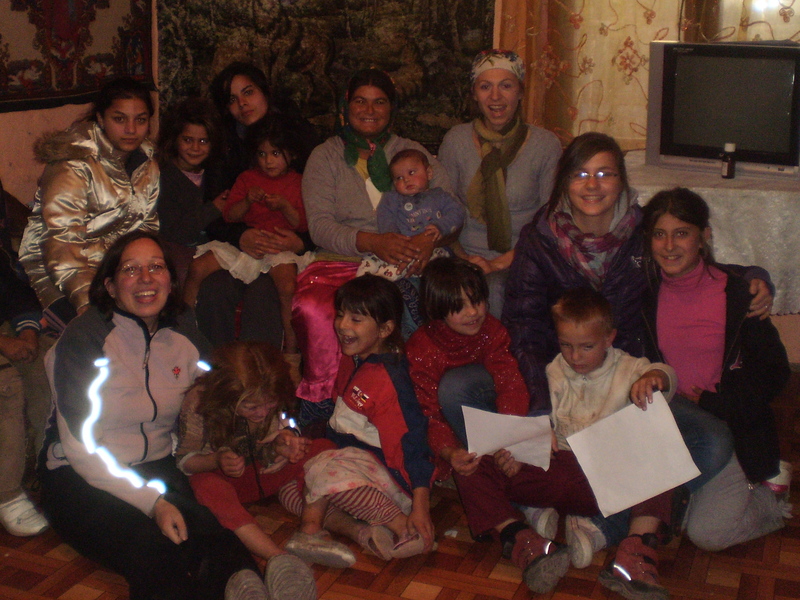 When the four other volunteers came into the house, more children came with them too so it was a very full house! I think there were 15 children in house plus six volunteers and the Mom as well. Can you image around 20 people in a very small one room house? Larry who is visiting from California for a month told the kids a couple of stories. I think the kids enjoyed the stories. Overall we had a great time with the kids and I heard the adult church service went well too! After my time at Sabolciu I came home to have a bite to eat for dinner. While I ate my dinner I watched a special episode for Veterans Day that the Extreme Makeover Home Edition TV show put together. It was a very moving episode and they also helped raised money for the veterans too. I also spoke to my Mom and a friend of hers that is visiting for the weekend with her husband. It was nice to catch up with them on Skype today! I learned from this video today that we communicate 93% with our body language and only 7% verbally. It made me think but it’s so true! I am from Whitby, Ontario. I have lived in Romania for 9 years as a missionary but I am currently in Canada on a sabbatical break at this time. I have also lived in South Korea for a year and I have also been to Russia, Uganda, Albania and the Czech Republic on short-term mission trips. In 2012, God also gave me an amazing opportunity to go to Mozambique for the Harvest Mission School with Iris Ministries as well. I love children, reaching out to people who are in need and vulnerable, I have a passion to fight against the injustice issue of human trafficking and to simply share the love of Jesus wherever I go. I also love cats too and I have a cat of my own named Minnie!